Choosing food for the HCG Diet can be hard because the diet calls for specific nutritional values, brands, and ingredients of products. In this article, we will help you find the right brands of foods for the HCG Diet. Some of the needed foods for the HCG Diet can be hard to find, such as the correct brand of stevia or the correct brand of grissini. We now carry some of the really hard-to-find foods for the convenience of our customers. We know how important it is to consume only 'safe foods', meaning that all foods, seasonings, sweeteners, etc. need to be HCG Diet protocol approved. In this article, we will be going over the following HCG Diet foods. Grissini Sticks: What grissini brand is allowed? What's the difference between grissini sticks and grissino? Salad Dressings: Are any store-bought dressings allowed on HCG? What dressings are allowed on HCG? Sauces: Are there sauces that are safe for the HCG Diet? What sauces are allowed on HCG? Safe Spices: Are any store-bought spices allowed on HCG? What spices are allowed on HCG? Safe Sweeteners: What sweeteners are allowed on HCG? What brand of stevia should I use on HCG? There are two allowed 'carbs' on Phase 2 of the HCG Diet (the grissini sticks or melba toast). We personally prefer the grissini sticks for the HCG Diet because they have a nice crunch! Grissini sticks are also known as 'grissino' or 'grissino sticks', so don't get confused if you see these terms when researching the best brands of grissini sticks. There are a lot of different flavors of grissini sticks available, but be aware that only the plain, garlic, and multi-grain grissini sticks are allowed on Phase 2. These little grissini bread sticks can be a major chore to find, and sometimes it is impossible to find depending on where you live. Besides the sheer difficulty of finding grissini sticks, the ingredients of some brands of grissini breadsticks are not allowed. Non-approved brands of breadsticks can even cause stalls or weight gain. We sell the 'Vita Vigor' brand of grissini sticks, which have been thoroughly tested for compliance with the HCG Diet. The Vita Vigor grissini sticks are imported from Italy, therefore, the ingredients are a lot cleaner to some of the Americanized versions of grissini sticks. For best results on the HCG Diet, make sure your grissini sticks are all-natural and one of the approved flavors. Our grissini breadsticks are imported from Italy to get as close to Dr. Simeons’ original eating plan as possible! A lot of our customers spend hours in stores trying to find salad dressings that are safe for the HCG Diet. There are tons of ingredients found in store-bought dressings and spices that are not allowed, such as sugars, oils, preservatives, etc. For that reason, we started doing research of our own... and created the Simple Girl brand. These dressings are a lifesaver for anyone on the HCG Diet. There are 4 flavors of Simple Girl salad dressings available. They come in both bottles and single-serving dressing packets (take them anywhere!). They are great on salads and double as a meat marinade. Simple Girl Sweet Vinaigrette Dressing: Our most popular salad dressing for the HCG Diet. It has a typical, simple vinaigrette taste and adheres strictly to both Dr. Simeons’ and Kevin Trudeau’s HCG Diet plans. Simple Girl Citrus Ginger Dressing: This dressing has a sweet, tangy, ginger kick to add some flare to your otherwise boring HCG Diet meals. Simple Girl Sweet Mustard Dressing: This is about as close as you are going to get to honey mustard flavor. So, if honey mustard dressing is your thing, give this dressing a try. Simple Girl Balsamic Vinaigrette Dressing: This is a premium dressing made with organic ingredients and tastes delicious! The rich, deep brown color of this dressing is evidence of the base ingredient, organic Balsamic Vinegar of Modena, which is imported from Italy. You may use these dressings in unlimited quantities. These salad dressings are oil free, calorie free, sugar free, safe for diabetics, all natural, and allowed on all phases of the HCG Diet. Used as a salad dressing on lettuce, cucumbers, tomatoes, slaw (cabbage), or spinach. Use as a fantastic marinade for seafood and meats. Your taste buds will thank you for this tasty addition to any allowed food! These salad dressings are made with secret blends of vinegar, all-natural stevia, and spices. You may use these sauces in unlimited quantities. 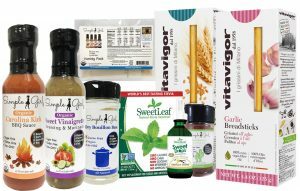 These sauces are oil free and sugar free (sweetened with stevia), safe for diabetics, and allowed on all phases of the HCG Diet. Use as a delicious marinade or topping for seafood and meats. Buy these pre-made HCG Diet safe seasonings so you don't have to spend time and energy analyzing products. They have been thoroughly analyzed and field tested to work well for maximum weight loss. There is a seasoning for every taste bud: spicy, salty, and sweet flavors. Simple Girl BBQ Seasoning — brings back the flavors of summer... yummy! Simple Girl Lemon Herb Seasoning — Amazing on cod, tilapia or any type of fish. Simple Girl Sweet & Hot Louisiana Seasoning — Great on meats, seafood and cucumbers! All our featured spices are allowed in unlimited quantities. These seasonings are oil free, calorie free, sugar free, safe for diabetics, all natural, and allowed on all phases of the HCG Diet. Sweeteners can be a little tricky... There are two types of sweeteners allowed on the HCG Diet, stevia and saccharin. Saccharin is a chemical concoction and a known carcinogen, therefore, we stick to using all-natural stevia. Stevia has become the latest health market craze, therefore, there are tons of brands of stevia available. The only problem is that most of the brands of stevia you find in the grocery store are not allowed on the HCG Diet. If you want to see if your brand of stevia is allowed on the HCG Diet, simply look at the ingredients. If you see any words ending in -tol, -ose, -dextrin, or anything similar do not use it! We sell the SweetLeaf® brand of stevia for the HCG Diet... it is one of the most inexpensive 'pure' brands of stevia available on the market. The only ingredients are certified organic stevia extract and soluble fiber. To view all our flavors, click HERE. Now that you've read this article, we hope you have a better understanding of the allowed foods for the HCG Diet.